This quinoa bowl is what our little viking has been shoving into his mouth most recently. We fear Orion is on the brink of becoming a picky eater. It might just be that summer is in full swing and between his grandma showing him how to harvest berries and us taking him strawberry picking, he’s pretty much on an all berry diet. 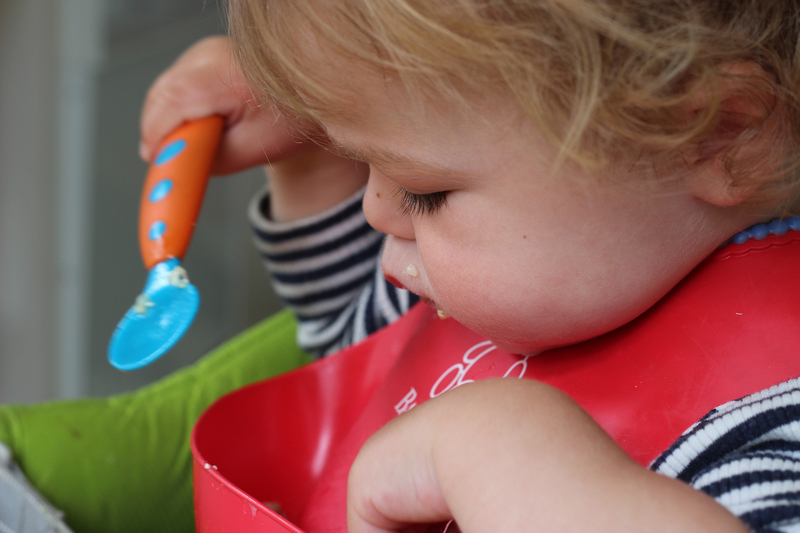 Meals he’s loved before have been dashed to the ground or pushed away with cries of “no, no, no.” We’ve grown tired of cleaning all the nooks and crannies of our kitchen from food he’s flung, although our dog is loving it, and we approach meals with a bit of trepidation and weariness. But luckily we’ve had a container of this salad we’ve been tinkering around with in the fridge, and it’s come to our rescue several times this week. We’re hopeful that this is a bigger part of the Orion puzzle as he fully transitions into toddler-dom and tries to assert his fledgling independence. We’re also cutting out all snacking. We’re having a small amount of luck getting Orion to eat more of his meals, although he still demands his berries and is subsisting primarily off of an expensive combination of “sta-bees, blu-bees, and rap-bees.” We’re pretty sure this salad will please all picky and non-picky eaters and even those who eat more politely than our son. Cooking quinoa can be a tricky endeavor to get the balance of liquid to grains correctly and the right temperature to ensure your grains will be fully cooked by the time the liquid has been absorbed. We watch quinoa carefully during the last five minutes of cooking and keep stirring every minute or so to make sure it’s not starting to stick to the pan. We can then keep an eye on whether or not the grains will be fully cooked by the time the water is gone so we can add more water a little at a time if need be to finish the cooking process. You know your quinoa is fully cooked when the germ of the kernel has pulled away in little golden curly-cues. You can start checking at 30 minutes to see if beets are roasted. 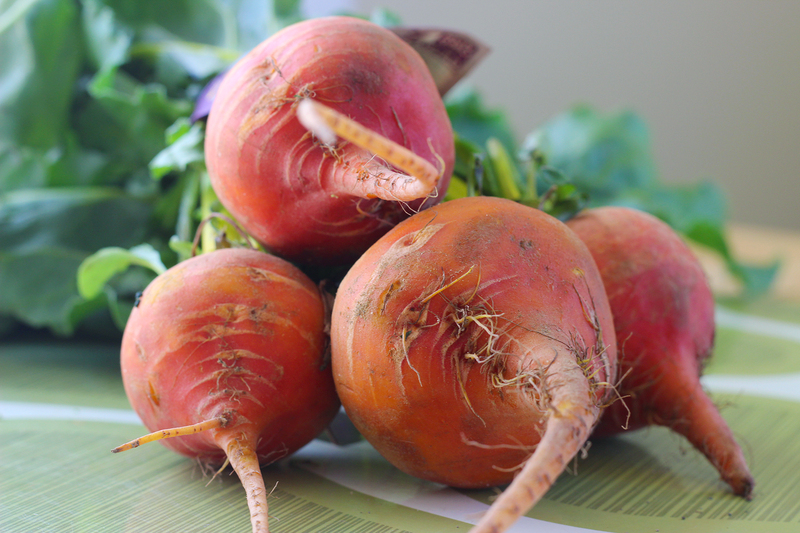 When they’re finished roasting, beets will be soft so that a fork will easily pierce the skin and meet no resistance as you push the fork to the center of the beet. We love roasted beets and add them to green salads and grain salads. They’re a great first food to introduce kids to since they bridge the fruit and vegetable worlds with their sweet flavor. Roasting them wrapped in tinfoil is our favorite way to prep them for ease and depth of flavor. 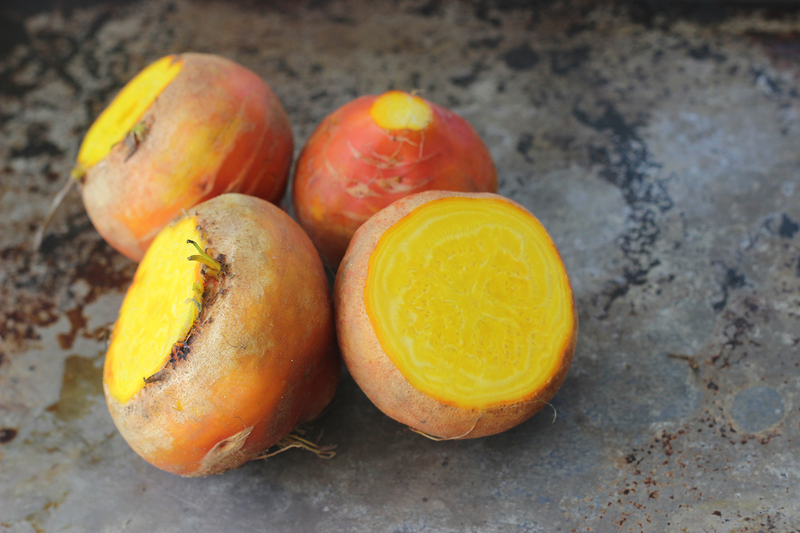 We recommend using golden beets though since they’re much less likely to stain your fingers, your cutting board, anything you or your kid are wearing, etc. If you do use red beets, we simply make sure to peel them with dish gloves over the sink and rinse immediately after peeling them. We also use a plastic cutting board so it’s easy to wipe down and avoid stains. This is another simple yet versatile grain salad base trying to offer a nutrition-loaded meal in as short a time as possible. Feel free to customize based on what you have on hand. We’ve made this with goat cheese and arugula instead. I could see using other roasted vegetables in the fall/winter, maybe carrots and raisins with some warmer spices and spinach or maybe adding in cucumbers and tomatoes in the summer. This grain salad meets the soysugarsherry test of being adult-approved, and we’ve been sitting down to lunch this week with Orion and a bowl of this salad for ourself. Preheat oven (or even better toaster oven) to 400 degrees. Cut greens off beets close to the top of the beet and wrap in tinfoil. Line a small cookie sheet with tinfoil and place the beets on top. Roast in the oven for 45 minutes to an hour (time will vary depending on how large the beets you have are). Let the beets rest until cool enough to handle. I like to roast the beets the day before and leave them wrapped in their tinfoil in the refrigerator to ease the prep for this dish. Once cooled, take beets and unwrap from the tinfoil. Using your hands, rub off the beet skins. Remove any residual roots or skin using a small paring knife. Then dice beets into 1/2 inch to 1/4 inch pieces depending on the age of your kiddo. Combine 1/2 cup quinoa with 1 cup water in a small saucepan. Bring to a boil, then cover and simmer on low heat for 15 minutes, checking every 5 minutes to stir and make sure quinoa isn’t starting to run out of water and sticking to the bottom of the pot. Add more water if necessary. Once the quinoa is fully cooked, dump the contents of the pan into a fine mesh strainer to drain any remaining water, then return the quinoa to the pan and cover. Let sit for another 10 – 15 minutes to dry out any remaining water so the quinoa will be dry and fluffy and ingredients will more readily mix in. Meanwhile, prep other ingredients. Dice the beets (see above). Toast the pine nuts and sliver the basil into thin pieces. 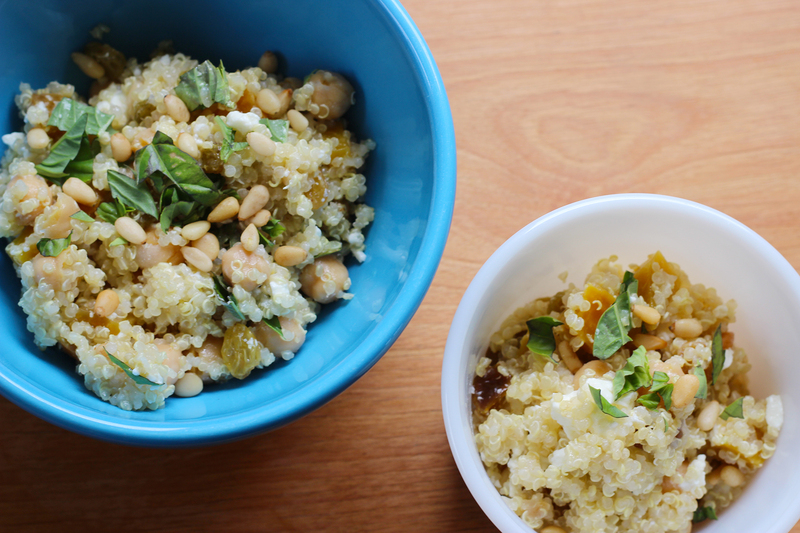 Using a large bowl, spoon the quinoa in and then add the beets, pine nuts, raisins, and chickpeas. Squeeze the lemon over the quinoa and add some salt and pepper then gently toss. Once ingredients are incorporated add the basil and feta cheese and gently toss again. Taste and adjust seasoning as needed then eat like a very healthy but boisterous viking.